Send your hubby to the supermarket and ask him to bring one good Camembert, one fresh baguette and a nice bottle of red. Then give him the recipe below and let him execute. It’s so good you will need nothing else. 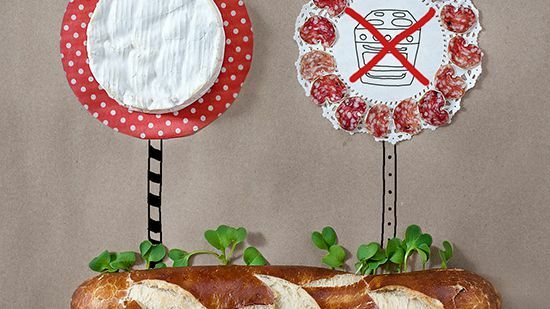 Three Little Halves blogger and illustrator Aleksandra Mojsilovic reimagines party prep with affordable, edible table displays. These are some of the headlines I bumped into recently while browsing through cyberspace. The menus are lavish and include creamy Parmesan risotto, sweet pea tortellini, ginger-glazed strawberries and Champagne-poached pears, and they’re aimed at hubbies and offspring who want to treat moms around the world to something special. I read the menus carefully, in awe and with great satisfaction, satisfaction that well-intentioned mankind, the hubbykind and alike, have achieved such a level of kitchen mastery that they can actually pull off these dishes. Past attempts to create such culinary wonders in our family have resulted in nothing but burnt cakes, destroyed pans, splashes that have spread all the way to the living room and loads of dishes I had to clean afterward (plus loads of anxiety on all sides). “By seeking and blundering we learn,” said Goethe once upon a time, and thus our family has learned. Now we have a different approach to Mother’s Day dinner, carefully constructed around my husband’s three key strengths: 1) he can successfully bring three items from the store, 2) he does know how to turn the oven on and even adjust the temperature, 3) he can be great company when relieved of cooking anxieties. So if you happen to face similar challenges around Mother’s Day, send your hubby to the supermarket and ask him to bring one good Camembert, one fresh baguette and a nice bottle of red. Then give him the recipe below and let him execute. Believe me, it’s so good you will need nothing else. And there will be no dishes to wash.
Take the Camembert out of the box, remove all of the packaging and place the cheese on a baking sheet. Bake for about 10 to 12 minutes, until the bottom of the Camembert becomes light gold in color.